Electric cars were supposed to be the cars of the future. Clean, efficient and quiet, whisking us to and fro while being kind to the environment and our pocketbooks. The EV1 electric car built by General Motors was to have been the first of what would be a whole new era in automotive transportation. But the dream was aborted shortly after its birth. A documentary called "Who Killed the Electric Car?" by Sony Pictures, reports on the ill-fated General Motors EV1 electric car that was sold briefly from 1997 to 2000 in California (This is a "must see" documentary for anyone who loves conspiracy theories about oil companies and car makers plotting together to squash electric vehicles). General Motors reluctantly built the car to comply with California zero-emission regulations which required auto makers to sell a certain percentage of zero-emission vehicles in that state. When the regulations were dropped due to pressure from the car makers and oil companies, GM abruptly pulled the plug on the EV1. The cars were all leased vehicles, so GM took all of the cars back from their owners and had the cars crushed and destroyed. End of story. At a GM press conference back in 1990, I saw and drove the first prototype for what would later become GM's EV1 production electric car. The car was originally named "Impact." GM later decided Impact was not the best name for a motor vehicle because of its negative connotations (like accident, collision, crash, injury, death). I still have the original press kit somewhere around here. At the 1990 Chicago auto show, GM unveiled its plans for the future: an electric-powered aerodynamic two-seater called the Impact. Powered by 840 lbs. of conventional lead-acid batteries, the 2,550 lb. aluminum-framed, plastic bodied car could zip to 60 mph in 8 seconds and travel 125 miles on a single battery charge. On March 11, 1994, a slightly modified Impact with six additional batteries set a land speed record for an electric powered vehicle of 183.822 miles per hour, proving that electric vehicles don't have to be slugs. In early 1995, GM built a test fleet of 50 Impacts for what would be a two-year, 12 city ride-and-drive evaluation program involving 1,000 different drivers. By giving people a chance to actually drive and live with an electric-powered car, GM is gaining invaluable real-world experience with the car before it is produced for the mass market. So far, the results have been very positive. Eighty-three percent of those who have driven the car for a week or more said it meets their needs. The average cost to drive the car (excluding the ultimate cost of replacing the batteries) has been 3.75 cents per mile at standard residential electric rates (equivalent fuel operating costs to a gasoline-powered vehicle that gets 40 to 45 mpg). The test fleet of preproduction Impacts are essentially production-ready now. They have such standard features as dual air bags, antilock brakes, cruise control, heat and air conditioning. The cars tip the scales at 2970 lbs., which is up over 400 lbs. from the first prototype. The driving range is about 70 miles city driving and 90 miles on the highway with the lead-acid battery pack. Zero to 60 mph acceleration is still in the 8-second range thanks to a 137 horsepower three-phase AC induction motor running on 312 volts of electricity from the battery pack. The batteries can be recharged in two to three hours using a 220 volt, 30 amp charger. I knew the lead-acid battery pack would limit the car's range initially, but I assumed GM would continue its work on battery development and offer a second generation battery pack with nickel cadmium. lithium ion, aluminum/air or whatever to give the car a greater range. That obviously never happened. I also assumed that down the road GM would eventually offer a gasoline/electric hybrid version of the EV1 to extend its range so it could be more than an urban commuter car. GM did build some prototype hybrid/electric cars based on the EV1 platform, but did nothing with them. I'm not privy to the inner politics and motives behind the demise of the EVi at GM, but from what I've learned from GM engineers the EV1 was a car GM executives never wanted to build. The car was built to comply with California's zero emission regulations (which were subsequently dropped thanks to intense lobbying efforts by the car makers, NOT the public). One GM engineer told me GM was losing thousands of dollars on every EV1 it produced because of the expensive battery pack. Apparently it was easier or more profitable to get the law changed than to find ways to reduce production costs. Are Electric Cars the Answer to $4 a Gallon Gas? In retrospect, it is too bad that GM did not stay the course and become a leader in developing and promoting the electric car market. 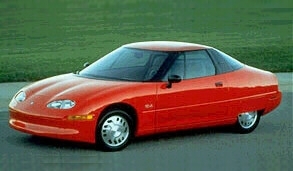 GM has built some great (and not so great) cars over the years, but the EV1 was something that was a real breakthrough. If the EV1 were still available today, even with its limited range lead-acid battery pack, they would be selling like hot cakes and dealers would have buyers standing in line ready to pay full list price and then some for a vehicle that needs no gasoline. And as the price of gasoline continues to soar, demand for the electric cars would only increase. GM would be gaining market share, not losing it, and would have a significant edge over all of its competitors including Toyota and Honda who have been the leaders in hybrid technology. But what do I know? I'm just a car guy, not a bean counter or an over-paid suit. To much hoopla, GM introduced their Chevy Volt plug-in extended range electric car as their answer to the Toyota Prius hybrid. Essentially an electric-powered car with a gasoline engine for a generator, the Chevy Volt offers extended driving (up to 400 miles) when the electric charge in the battery is used up. The Volt's range in full electric mode ranges from 25 to 50 miles, giving it the gasoline equivalent fuel economy of 93 miles per gallon while running on battery power alone. The Chevy Volt's list price is a hefty $40,280, but is offset by a $7,500 federal energy tax credit. GM hopes to sell upwards of 30,000 Volts in 2011. For an overview of the Chevy Volt, Click Here. 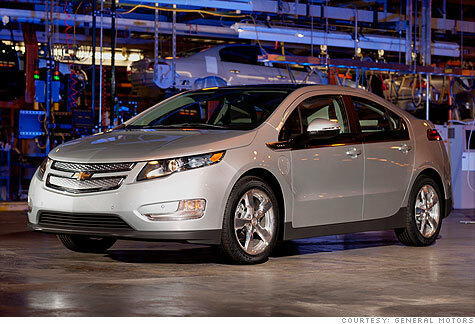 Chevy said it failed to reach its sales goal of 10,000 Volts in 2011. Dealers sold fewer than 7,000 Volts, a disappointing figure considering GM had the capacity to build and sell several times that number. Sluggish sales were blamed on the sluggish economy. Though gasoline prices have been inching towards the $4 per gallon mark, General Motors said it has temporarily suspended production of the Chevy Volt due to sluggish sales and a huge backlog of unsold Chevy Volts in dealer inventories. Others say the car is overpriced for what it delivers, and does not make economic sense compared to other cars that are capable of delivering 40 miles per gallon for half the price of a Volt (such as the Chevy Cruze). General Motors reported that it has sold nearly 21,000 Chevy Volts in 2013, compared to roughly 13,000 Corvettes. Based on these sales figures, it looks like the clean practical plug-in extended range electric car is outselling American's number one sports car. The Chevy Volt's main competitor in the plug-n electric car market in 2013 was the Nissan Leaf (over 20,000 sold), followed by the Tesla Model S (over 16,000 sold), the Toyota Prius PHEV (over 11,000 sold )and Ford C-Max PHEV (over 6,000 sold). Overall, electric car sales are up over 300 percent in 2013. Compared to the number of hybrid vehicles and conventional vehicles that were sold in 2013, these numbers are still very small -- due in part to the limited availability of lithium-ion batteries. Even so, it does show growing public interest in electric vehicles and a slow shift away from petroleum based fuels. In spite of the fact that numerous auto makers now offer one or more electric vehicles or plug-in hybrid vehicles, the temporary drop in gas prices has kept sales below target in recent years. Today, electric cars and hybrids account for less than 3 percent of all new vehicle sales. Still, that's nearly half a million hybrid and electric vehicles that are rolling off of new car dealer lots. Tesla becomes Number 1 Electric Vehicle Manufacturer in the World! After struggling to launch its Model 3 due to production issues (and internal sabotage by a disgruntled employee! ), production of the new Model 3 has now reached 5000 per week. This makes Tesla the leading EV manufacturer in the world. The new Model 3 is now ranked in the Top 20 vehicles sold in the U.S. this month. Tesla also announced that it will no longer require potential buyers to put down a $1,000 deposit on their order. Sales are open to all and now require no deposit. The Tesla Model 3 has a maximum range of up to 310 miles on a charge, and can accelerate from zero to 60 mph in 3.5 seconds with the upgraded battery performance package (which is faster than a 2018 Corvette with a 460 horsepower 6.2L V8 engine!). Prices range from $35,000 for the base model to over $78,000 for the all-wheel drive performance model. If GM killed the original electric car, Elon Musk has certainly been the one who saved and redefined the electric car. Nobody thought he could do it,. but he did! For more info on the Model 3, visit the Tesla Model 3 information page. Tesla reported total vehicles delivered in 2018 as being 245,240, including 145,846 Model 3s. Should You Buy a Hybrid or Electric Car?